Om Nom Nom is a very quick and light game of predicting what other players will do. On the table are 3 boards showing a different set of animals/food in predatory order: Wolf/Rabbit/Carrots, Cat/Mouse/Cheese and Hedgehog/Frog/Fly. So, at the top is the main predator, below it is the predator’s food, and below that is the predator’s food’s food. However, there’s a catch: The eating gets resolved from top to bottom on each board. This means a predator at the top of a board may eat the animal below it before that lower animal gets a chance to eat the food below them. 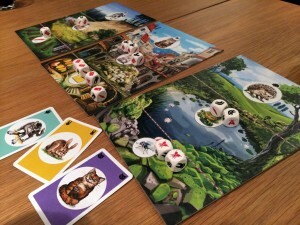 In the photo above, if player A played a hedgehog and player B played a frog, then player A would eat player B’s frog along with the 2 frogs on the dice and this would happen before player B’s frog gets a chance to eat the flies. You score 1 point for each of your own animal cards that didn’t get eaten when played. Most points after 3 rounds wins. Mauna Kea is a game about explorers fleeing from an erupting volcano. 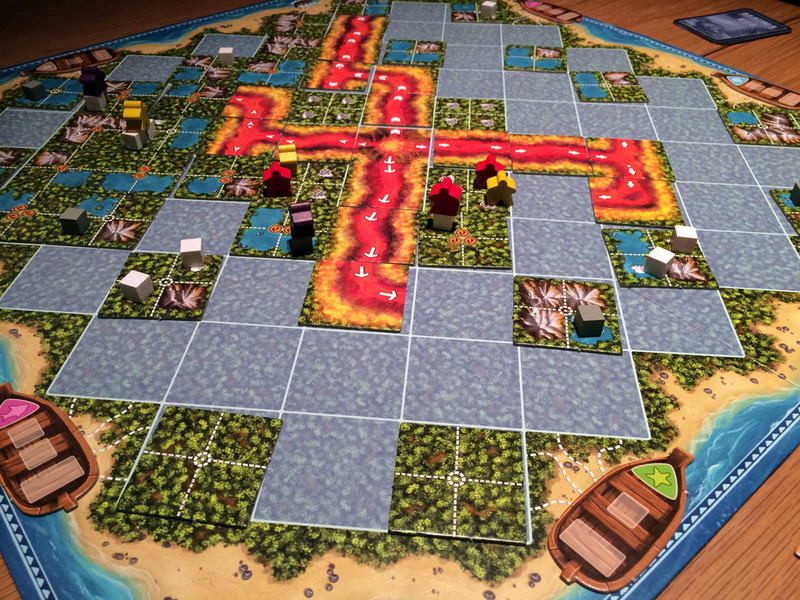 This is not a co-operative game so players will be stepping over each other to take the boats along with as many artifacts as they can with them. The board starts with many blank areas and the landscape will get filled in during the game. Landscape tiles (which get drawn from a bag) display 4 smaller squares which can each be of a different terrain type, plus each tile shows a number of movement points too. 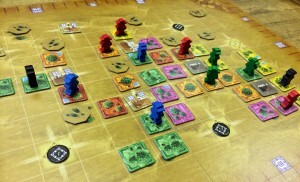 Each turn, a player draws tiles from the bag until they have a total of 5 or more movement points. On their turn, players must use their tiles either for movement points to move their explorers, or for placing on blank areas of the board to reveal the landscape. Tiles with lava don’t count towards the player’s tiles and are immediately added to the matching lava flow (there are 4 different flows from the central volcano) and an arrow shows the direction too. Sometimes the lava flows split too. Moving through water spaces costs more movement points than moving through jungle areas, and spaces containing mountains and lava block movement. 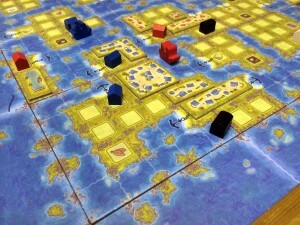 This is the main game board. There is also a small board (the Guild Board) too. 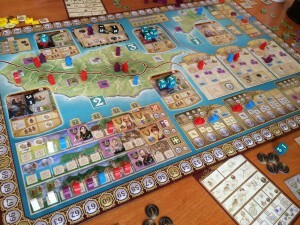 What’s Your Game have released some excellent games like Vasco de Gama and last year’s superb (and undeservedly less-known) Oddville. 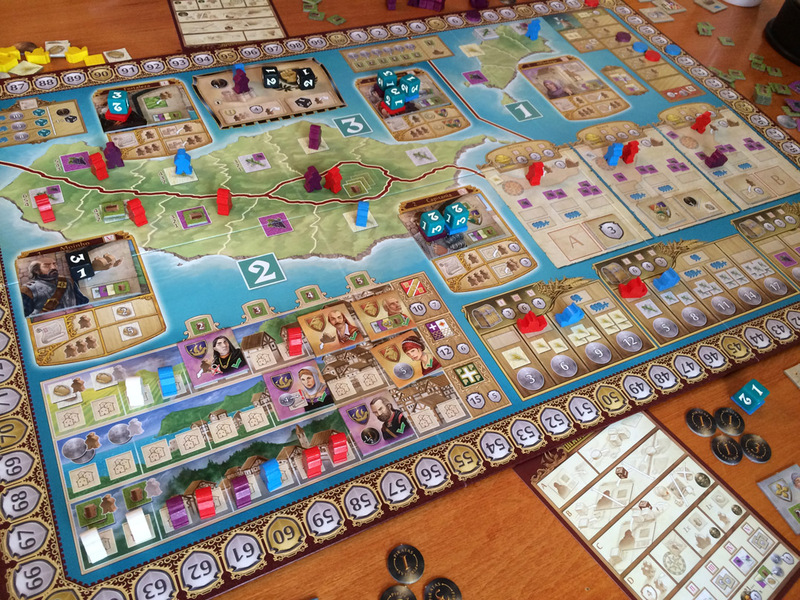 This year’s game, Madeira, is a very meaty eurogame – none of the game mechanics are complicated, but there are lots of them and they are quite interwoven. Each round, players select a set of action dice which they place to use on the character’s actions, and potentially the building’s actions too. 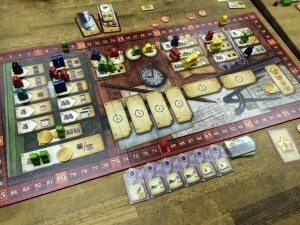 As well as cash and various resources, players have workers and ships which can be moved to various areas of the board. When triggered, workers on fields harvest that field’s resource, workers in colonies generate resources each round, and workers in cities can generate cash, food or bread. (Workers can also be in the city watch area.) Ships moved to markets and colonies can exchange resources for cash and special abilities respectively. 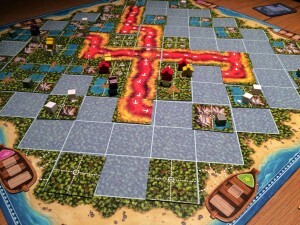 The board shows 5 buildings and some islands areas (located in 3 regions) and each building has a character on it too. The characters move during the game so are not always paired with the same buildings each round. The game is played over 5 rounds. 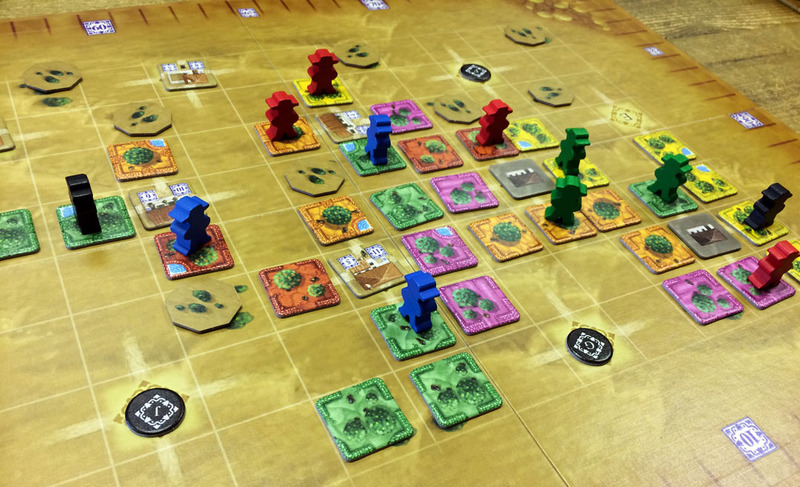 At the start of each round, each player selects a row on the Guild Board and takes the 3 dice next to it (which have already been rolled – values are 1, 2 or 3). Plus, the player selects one of the remaining Crown Request tiles in the same row – these earn points at the end of some rounds. The row selected also determines turn order for the next phase, plus it allows the player to reactivate some guild favours (special abilities) if they have any that match the row’s colour. 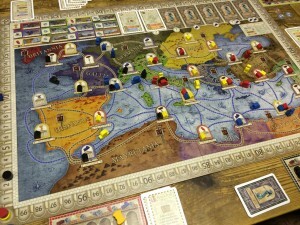 The main game board at game end. The large pale yellow oblong spaces are where the engineers are located during the game. 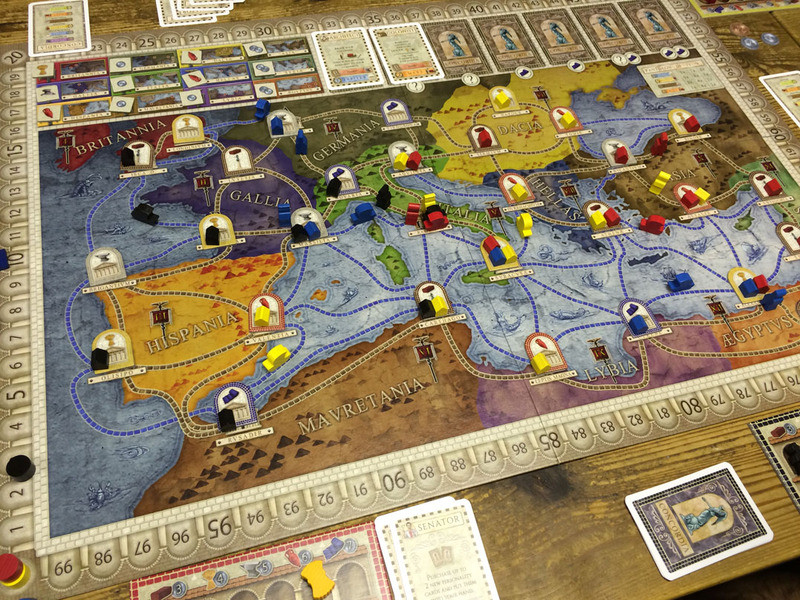 Russian Railroads is a meaty, worker-placement eurogame. As you may expect from the title, players compete to construct the best railroads across Russia. Unlike many railway-building games, there is no map to build across; however, this isn’t a hindrance and actually makes the game different to other games. 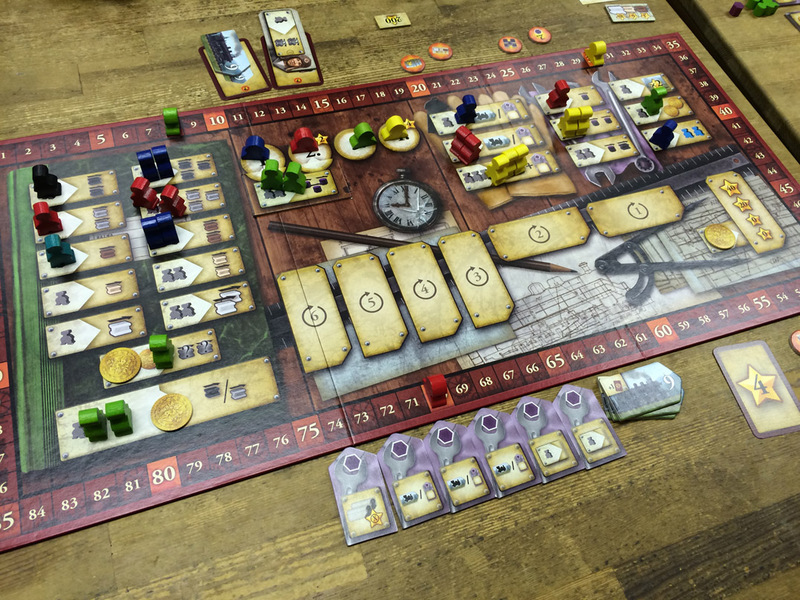 There is a central game board where players place their workers to take actions, plus each player has their own player boards to track their progress.